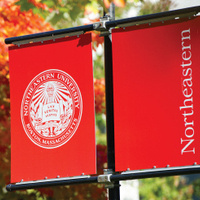 The award-winning Northeastern University Alumni Center is your home on campus. This state-of-the-art conference and event space, with dramatic views of downtown Boston, was designed with you in mind. Network with fellow alumni or catch up with old friends at an event, before exploring campus, or when you dine at the Faculty Club. The Alumni Center is located on the 6th floor of Columbus Place, located at 716 Columbus Avenue on campus. A lunch provided by the philosophy and religion department and the PPE program to celebrate the graduating students of December 2018 and May 2019. So glad we do this event! Oktoberfest was a blast! My first time attending and I will definitely go again. Informational, inspirational, good food and great company! Good place to meet new peoples!! I enjoyed hearing about each of the countries, their status, and why the Arab Spring had gone so differently. I enjoyed the discussion and wish it could have been longer. this kind of topic is definitely fresh to me. as a Chinese student, even back to China. our media doesn't address the war as the was as US does. it is great to hear story from another side of voice. i'll keep my eyes on it. As a new employee, I enjoy this event -- an opportunity to learn about NEU from young alums. This was my first 1st Thursday and I really had a great time. The band was awesome. I'm looking forward to the next one. It was nice of President Aoun to show up for a few minutes.